The Gold Industry Group (GIG) was joined by Saracen Mineral Holdings and Independence Group at the annual Euroz Big Walk in Perth on Sunday 17 March, raising $120,000 for the Perth Children’s Hospital Foundation (PCHF). 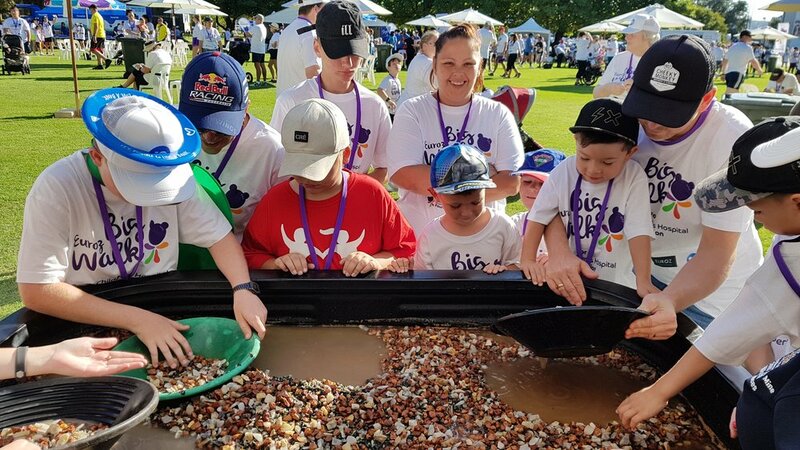 The 13th Big Walk event saw 2,500 participants, spectators and volunteers come together for a 6 km walk alongside the Swan River, starting and finishing in Burswood Park, with funds raised helping to change the lives of many Western Australian children, adolescents and their families. The GIG’s gold panning station at the finish line was a big hit with budding prospectors of all ages diving in to claim their free #heartofgold prize bag. Thanks to Saracen Mineral Holdings volunteers, our gold diggers had a fantastic time. Among a number of other businesses and service providers, there was a host of fun, family-friendly activities in the park for participants and spectators to enjoy. We were also joined by Independence Group who had a team on the day and raised funds. “Team IGO Make a Difference were thrilled to take part in the fantastic Euroz Big Walk, gathering together ten of our employees and their family members bright and early to get involved,” said Independence Group’s Exploration General Manager Ian Sandl. “We were proud to collectively raise approximately $5,000 for this worthwhile cause. “We will be back again next year!” Mr Sandl added. Registrations and additional funds raised by more than 1,600 participants, along with all proceeds made on the day from the sale of merchandise, food and beverages went to the PCHF, raising a total of $120,000. “There was such a great buzz throughout the day, and it was wonderful seeing so many familiar and new faces,” said PCHF Chief Executive Officer Carrick Robinson. A live band and children’s entertainment group on the main stage kept the crowd grooving, whilst other activities within the park and positioned along with route included: netball shooting hoops, dance and cheer leading groups, giant bowling, mini obstacle course, treasure hunt, face painting, a lucky dip, ring toss and a sweet bun decoration station. Other member supporters of the PCHF include Deloitte’s sponsorship of two brightly coloured dolphins in The Big Splash and The Perth Mint’s donation of $60,000 worth of Young Collector coin albums to brighten the stay of unwell children and champion The Big Splash. Since opening in June 2018, the Perth Children’s Hospital is the new centrepiece of Western Australia’s child and adolescent health care system (replacing the now closed Princess Margaret Hospital), providing specialist medical treatment and secondary services including inpatient, outpatient and day stay care. The PCHF is the hospital’s leading fundraising body, promoting healthy lifestyle messages to support parents in keeping their children well. For other community events and activities, visit the Events page. READ MORE COMMUNITY, GIG AND MEMBER NEWS.